Now that we're past the heavy stuff, and letting go and moving on it's time to talk about how amazing my bridesladies are. I have been looking forward to this past weekend for a very long time. When it came to planning my shower, MOH Cass the queen of surprises asked me what I wanted in terms of knowing. While I know a total surprise shower would have been something she would have loved to have pulled off, I personally don't like surprises. I always somehow find out about them, and I've been to a surprise party or two where the person really would have liked to have known so they could you know, be a little prepared. I wanted to be able to get my nails done, and schedule my make-up trial. So, the surprise compromise was that I could know the date and time, but nothing else. It was the perfect plan, because I enjoyed knowing absolutely nothing, and was really excited that the girls were all so excited about what they had come up with. The day finally came, and they truly pulled off the most lovely shower. It was perfect. Words cannot even begin to describe how thankful I am, so I'm not going to even try. I'm just so incredibly blessed by the amazing women in my life. The theme? 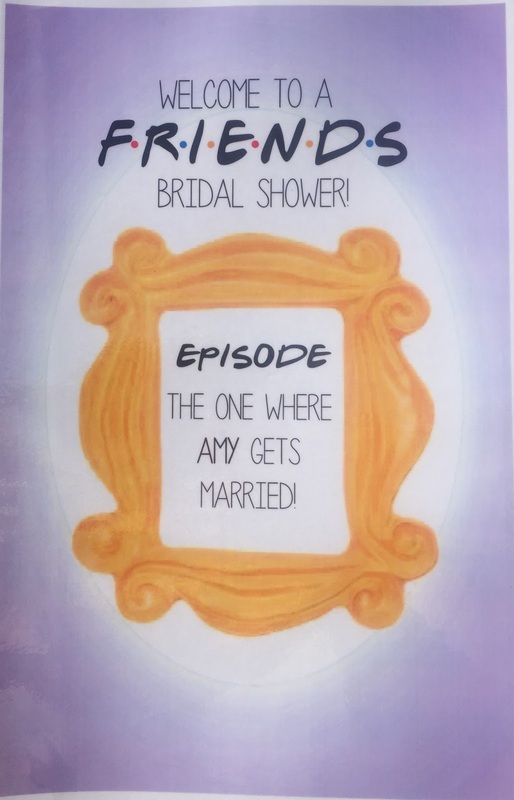 The One Where Miss Narwhal Gets Married. You may have noticed by now that I tend to throw a Friends reference into my posts quite frequently. When planning the theme of my shower MOH L suggested Friends, and since MOH Cass is probably the biggest Friends fan in the world (she has literally watched the series more times than anyone I know), it was the perfect shower for her to take the lead on planning. The details and ideas they came up with were nothing short of incredible. They transformed my Aunt and Uncle's house into a purple and yellow Friend's filled space. There were tissue flowers everywhere and love quotes from Friends framed all around the room. BM Click and her sister made chocolate favours for everyone to take home. They were wickedly delicious and a huge hit with everyone! They had Friends playing silently on a large screen, and so many other thoughtful details everywhere. They even had a large Christmas flower on standby just in case anyone had a Phoebe hummus moment (The One Where No One's Ready). Next up we'll get to the actual shower! Did you know about the theme of your bridal shower?